Below are some guidelines for setting up your artwork correctly, some do's and don'ts that will hopefully assist you when ordering online. Click on the heading to open tab. 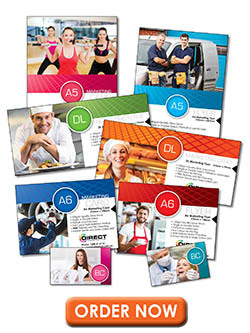 We have prepared a range of tools to assist you in getting the best results from your printing. Our Sales representatives also carry with them a Colour Chart Book that have a range of colours printed in CMYK on our most commonly used stocks. Call us if you are not sure what the effect will be and we will see if we can get someone out to see you to advise. We’re always happy to help. We advise that files should be created with professional layout software such as Adobe Indesign, Adobe Illustrator, CorelDraw, or Quark to get the best results when printing. Files are then to be saved as a PDF with the following settings: resolution at 300dpi, fonts outlined or embedded, 2mm bleed (5mm bleed for booklets and catalogues), and trim marks. Adobe Photoshop can be used, but your artwork will give text a soft pixellated look and will not be as sharp as if a page layout software was used. Convert your colours to CMYK. If your program does not support CMYK (e.g. Microsoft Word, Publisher and PowerPoint) we advise that you call or email us for assistance as we do not want you to be disappointed with your printing. If you are concerned about specific colour matching for colour logo, for example, please discuss this with us. • Heavier stock weights use 40 / 40 / 40 / 100. • Lighter stock weights use 10 / 10 / 10 / 100. Even though your images may look great on screen we require images to be 300dpi at actual size for printing. That way you’ll guarantee sharp images in your printing. The lower the resolution the worse your images will look when printed, so keep this in mind when scanning or sourcing images for your project. If your job prints right to the edge of the pages, we require a minimum of 2mm of bleed on your files. Bleed is the area that extends past your trim (crop) area and allows for a small amount of movement that may occur when your printing is put throughout the guillotine. Please include crop marks to indicate where file should be trimmed. When sending artwork to print, the fonts used must be outlined or embedded into the PDF file so that there are no issues and print correctly. Although most layout programs do embed the fonts there is always the off chance that some fonts could rebel and it is always a good practice to outline any unusual fonts to avoid problems. Please ensure you supply your artwork to us as individual pages in the PDF, not as spreads e.g. a 16pp booklet should be supplied as one PDF with 16 pages. Our pre-press experts will impose the booklet for you. Allow a minimum of 5mm bleed on all edges. Booklet “creep” will occur during finishing so we recommend you keep text and non-bleed images at least 10mm from the trim line. Spot UV can provide a premium result when highlighting a logo, image or bold type by applying these areas with a gloss varnish, or applied as an overprinted PATTERN over solids for a more creative result. When supplying final artwork which requires Spot UV, artwork should be supplied with an extra PDF file which contains all Spot UV elements set as a Spot Colour named ‘Spot UV’. UV varnish can sometimes shift slightly when applied. Avoid applying UV to thin lines, small text or finely detailed artwork. • Open your artwork in Indesign. • Create a new layer for the Spot UV application. • Select the elements you wish to enhance with Spot UV and duplicate them to the new Spot UV layer. • Select colour type “Spot Colour”, and convert all Spot UV elements to this new spot colour. • Spot UV elements should all be set to 100% Opacity. • IMPORTANT - Select all graphics on the Spot UV layer and set them to “Overprint Fill” in the Attributes palette (Window/Output Attributes). • Select “Overprint Preview” from the ‘View’ menu to CHECK your work. • Export the Spot UV layer - by turning off all layers except the new Spot UV layer, then export as a single PDF with all trim marks. • Proceed to export the CMYK file by turning off the Spot UV layer, then export all CMYK layers with trim marks. • For BUSINESS CARD or SINGLE Page - Combine both Spot UV pdf and the CMYK pdf into a SINGLE PDF - with the last page being the Spot UV. • Page 1 will be the Business Card side which requiring the Spot UV to be applied. • Page 2 will be the Reverse side of the Card. • Page 3 should be Spot UV ONLY (as a spot colour marked Spot UV). Please ensure you supply your artwork to us with front and back combined into a single PDF file. • Gloss and Matt Lamination on 1 side will always be treated to Page 1 of your document. • All card variations require a separate PDF for each name. (not all in one PDF). Below are some guidelines for setting up your artwork correctly, some do's and don'ts that will hopefully assist you when ordering online.